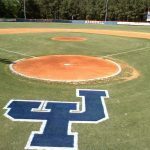 Monday, March 28, 2016 12:00 AM James Island Charter High School AWAY 6 HIT Tournament HOME 0 Game Recap James Island Jason Weatherford. 1-0 6 IP. 0 ER. 5 K’s 0 BB Vincent Bodison 2-2 2 H 1 2B John Thelan. 1-3. 1 R. Jackson White. 1-3 1 R. 1 RBI Brooklyn-Cayce Chandler Sox (L). Friday, March 25, 2016 7:00 PM James Island Charter High School AWAY 6 Wando High School HOME 2 Game Recap James Island Jackson White (W) 2-1 3 IP. 0 ERA. 3K’s Vincent Bodison. 3 IP 1 ERA. 4K’s Patrick Dizon 2-3. 1 2B. 2 R. 1 RBI Bo Owens. 2-2. 2 RBI Hunter Chinnis. 2-3.